We left off with the transformation of Western society to the Industrial Age, focused on progress and profit. We continue into the 20th century, where rationalism and empiricism continue to fuel the push for productivity. The first kind of mechanical engineers utilized new concepts of scientific management to organize workplaces for increases in efficiency. Frank and Lillian Gilbreth performed motion studies and Frederick Taylor performed time studies, testing how to improve productivity and efficiency in factories. They discovered that breaking up production into a multi-step process and assigning a step of that process to one person was more efficient than having one person performing all the steps. The craftsman had no place in this new structure. The assembly line methodology removed autonomy from the worker and created supervisors as part of a larger command and control management structure. Workers now functioned as replaceable parts in the process of production. Completing the same task repeatedly all day required minimal skill and produced maximum output for corporations. This made workers compliant and controllable as they could be easily replaced. Engineers and office owners transposed the concepts of Taylorism from the factory to office design via impersonalized, standardized and economical uses of space (1). This methodology fit with the clerical nature of early office work and typically equated to open floor plans with desks facing a supervisor. Employees were constantly reminded by this arrangement that they were being watched, and should perform their assigned tasks accurately and quickly. As office layouts were being influenced by the prevailing empirical methodologies, the design of the office building itself was being developed. Prior to the development of modern building systems workplaces again took their cues from the manufacturing realm. Workers required natural sources of light and ventilation so office designs had to incorporate large and numerous windows and skylights as well as high ceilings. But, because the worker was the machine of production, the office building began to incorporate other more novel features. A good example is The Larkin Administration Building in Buffalo, NY, designed by Frank Lloyd Wright in 1903. The entire exterior was clad in brick including a brick roof that was utilized for recreation. Each entrance boasted a pair of waterfall fountains. 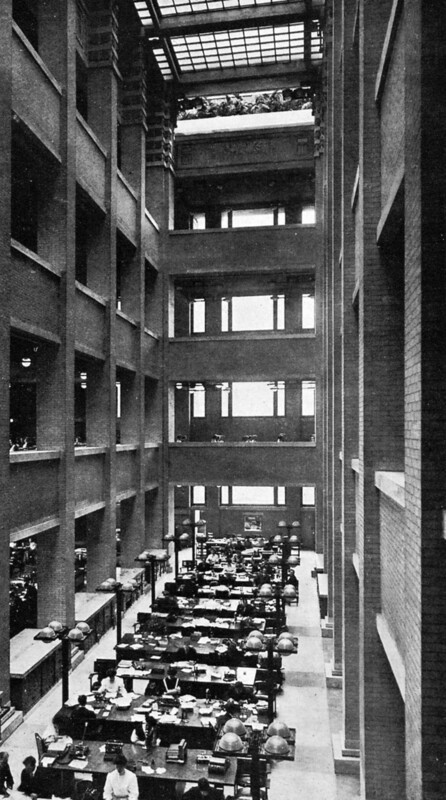 The interior of the building centered around a seventy-six foot tall light court which provided natural light to all floors of the building. The balconies surrounding this central space made it possible to monitor the workers below at all times. Additionally, the top balcony housed a kitchen, bakery, dining rooms, classrooms, a branch of the Buffalo Public Library, restrooms, a roof garden, and a conservatory. This building, with all of its features, was revolutionary in its day and attracted international attention. The first major shift in the office environment arrived with the development of electricity, lighting and other related innovations such as heating and air conditioning. These new technologies allowed for longer work days and smaller, enclosed workspaces. The offices and buildings that housed these operations became accessible for longer periods of time. This progress began to sever employees’ direct relationships with their natural environment and the workspace started to resemble a man-made machine. The rapid advancements in technology, manufacturing, and organizational thinking, observable from the 1930’s, were also changing the overall structure of our society. The abundance of material products from manufacturing processes stimulated the economy. New business sectors emerged, offering a greater variety of goods and services. Progress also fueled an era of consolidation. Vast amounts of employees laboring under one boss generated business giants who bought out competitors and monopolized industries. By the 1950’s a mere 0.5% of American corporations controlled more than half of the nation’s corporate wealth. The support required to manage the large corporations coupled with an ever increasing need for capital to sustain their growth propelled development of other fields such as: financial services, insurance, hospitality, retail, health, human services, information technology and education. During the 1950s and 60s, societal shifts that emerged from the Civil Rights Movement and the Women’s Rights Movement trickled into the office. People wanted less social boundaries in and out of the workplace. In addition, the Western world was exhibiting itself as a society in constant flux, evolving, discovering and innovating. It was an era of new frontiers: the hydrogen bomb, Sputnik, NASA, the polio vaccine, the Birth Control pill, the computer, the Peace Corps. The nature of work was changing; innovation required planning and collaboration, which demanded different seating layouts. Workers needed spaces that would generate communication. In response to these new operational needs office furniture itself became something to consider and design. In the 1960’s the Schnelle brothers designed Bürolandschaft (German for office landscape). Instead of fixed walls their new product featured an open floor plan with a variety of standard desk configurations and screen elements that worked together to create the office layout (2). Some were side by side, suited for solitary record keeping and focused work. Some were grouped together facing in, effective for planning, collaborating, inventing and brainstorming. The downside to this design was an increase in visual and auditory stimuli, resulting in distraction and loss of concentration. Designers and furniture manufactures continued to develop the concept. Robert Propst, working for Herman Miller, devised movable partitions that would block stimuli when a worker needed to concentrate, yet that could be easily rearranged to facilitate conversation for collaborative work. In 1967 he designed the Action Office system (3). Propst imagined interconnected spaces that promoted productivity. His intention was to create an organic and dynamic workspace. Propst envisioned employees proactively using his invention, constantly rearranging their spaces to best match the type of work they were performing at that moment. He wanted to give workers command and control over their environment to increase their yield and satisfaction. His drive for increased productivity however had an unfortunate side effect. The movable walls and furniture systems helped cut down on construction and development costs, which made them popular. But it also influenced a drive for efficiency as office space became more in demand and rents increased. Companies turned this demand into an opportunity to maximize floor space economy. They began to stack Action Offices so closely together that they were immovable and their original intention was lost. The modern cubicle was born. The usage of cubicles hit an unhealthy high from the late 70s to the early 90s. The workstation was so ingrained in the corporate structure that the space a worker was provided with showed them their status in the hierarchy of their company as well as the path for advancement. A large desk, proximity to a window, or an office all marked the varied levels of valued positions available in the firm. A ring of offices enclosing a Cube Farm became the norm for office layouts (4). Ergonomic, social, and psychological problems began to surface from working in this environment every day. Many workers felt trapped and lonely within this setting that provided minimal external stimuli for the brain or psyche. Being enclosed in a small space with artificially generated light and air and limited human interaction created mental, physical and emotional exhaustion. Additionally, in the 80s and 90s, society began to notice the environmental exhaustion created from sourcing and disposing of the materials used to construct and maintain a functioning office building. In the 1990s designers started focusing on environmentally friendly design and spearheaded the Green Building Movement. They assessed the effects of building materials and systems on the environment and devised strategies to decrease energy consumption and waste, improve water efficiency, and source recycled and sustainable building materials. The Green Building Councils of the world agreed that factors such as interior layout, air quality, lighting, acoustics, access to the natural environment, and opportunities to exercise directly influence worker productivity. They acknowledged the interdependent relationship between the workspace environment and the general health of its inhabitants to the success of the company. It took years to achieve general acceptance of these new ideas. But there are now many successful examples such as Francis-Jones Morehen Thorp’s Commonwealth Bank Place at Darling Quarter in Sydney, Australia (2010). The interior features open, window-filled spaces that keep workers in visual contact with their environs. The comfortable seating options offer an inclusive approach to working, which the company calls “activity-based working.” The architecture aids “varying levels of concentration or collaboration” with its “home zones,” breakout rooms, collaboration spaces and designated meeting areas. Technological advancements of the 90s and 2000s also played a part in the development of office design. Cell phones and laptops mobilized the office. Workers and their tasks became portable and working from home and “third spaces,” such as coffee shops, became an option. Ease of travel and communication sped up interactions and heightened worker responsibility. Collaborative Office Spaces are the focus of the 21st century (5). With the rise of social media (Face Book, YouTube, Twitter) and social communication devices (Skype, FaceTime), social boundaries are dissolving. Thus, to mimic this virtual freedom in their office spaces, tech companies are favoring a reinvented state of Bürolandschaft for more freedom in their floor plans. Mobility of work is key, with open spaces designed to establish interaction. Corporations intend to provide their employees with a comfortable environment that encourages conversations between different departments, helping to shape collaborative ideas and solutions. This has manifested in unusual program elements including social gathering spaces like gardens, kitchens and living room spaces and through amenities like gyms and childcare. These new features are also blurring the lines between home life and work life and represent a force with potentially broad social implications. These changes raise many questions. What are the repercussions? Does this create more of a workplace community or just a space in which it’s difficult to focus? Does providing socializing and other basic needs at the workplace deplete employees’ cognitive and creative aspirations? Or perhaps these companies are finally providing appropriately designed spaces for the nature of work in our society. How is the autonomy of the worker affected and is this just another command and control structure? Is productivity still the main goal? These thoughts and inquiries lead us into the next few articles on technology and current trends in the office.